Well aren't these two looking adorable? Pathé and BBC Films have debuted a first look photo at the film Florence Foster Jenkins, the latest from director Stephen Frears following Philomena, Lay the Favorite and Tamara Drewe. 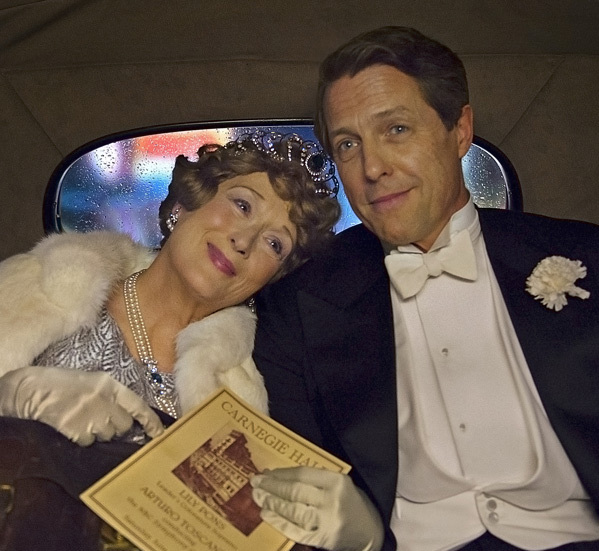 In Florence Foster Jenkins, Meryl Streep plays the legendary New York heiress who became an opera singer. Hugh Grant plays her partner St Clair Bayfield. The two can be seen riding in the back of a car, heading home from (what seems like) a night at Carnegie Hall. No release date is set yet, and the film just barely started shooting, so this is a very early first look and we likely won't see this until 2016. Anyway, take a look at the two in full below. Photo sent out directly from Pathé and BBC Films' publicity. Florence Foster Jenkins is the true story of the legendary New York heiress and socialite who obsessively pursued her dream of becoming a great opera singer. The voice she heard in her head was beautiful, but to everyone else it was hilariously awful. Her "husband" and manager, St Clair Bayfield, an aristocratic English actor, was determined to protect his beloved Florence from the truth. But when Florence decided to give a public concert at Carnegie Hall in 1944, St Clair knew he faced his greatest challenge. The film is directed by Stephen Frears from a screenplay by Nicholas Martin. The cast includes Simon Helberg, Rebecca Ferguson and Nina Arianda. Being produced by Michael Kuhn for Qwerty Films and by Tracey Seaward. Stay tuned. I smell another Oscar Nomination for Meryl! You look so Oscar worthy, Meryl. Ah man...this sounds pretty good. Grant's old man make up is alright.